I am sharing a card today that I totally cased from the amazingly talented Alice Wertz. Her card was published in the 75 Creative Card Challenges by Papercrafts Magazine. She was so kind in allowing me to share my version with you. it too much until recently and found it super easy to work with. ranks right up there for me. Plus the phrase is perfect for all your girlfriends in need of a smile. Did you know Great Impressions Stamps is now on Facebook? of our stamps in action! love love how you used those tape, Jenny! superb card! 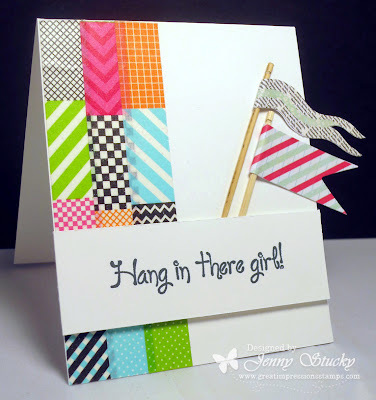 I love this colorful card of encouragement. The washi tape is fantastic with the banners. Thanks for sharing. I LOVE this card! Great use of Washi tape. So cute-washi tape sticks to me-not the card LOL!